The AfSBT Step-Wise Accreditation Programme (SWAP), has been implemented with the goal of maintaining and enhancing the quality and safety of blood transfusion in Africa. The accreditation programme is based on Standards prepared by a sub-group of the Task Team for Accreditation established by AfSBT. Accreditation by the AfSBT provides formal recognition that the blood transfusion facility meets all the requirements of the stipulated step of the AfSBT Standards: Step-Wise Accreditation Programme (ACRR01). The competence of the facility to perform the functions to be accredited will be assessed through a formal process designed to show that the functions routinely satisfy the stipulated criteria and that the documented Quality System is fully implemented to support these functions. The programme takes cognisance of the fact that blood services operate at different levels of development and therefore cannot be inspected for accreditation purposes at the same level. The stepwise system enables facilities to progress from basic quality and operational requirements to an intermediate stage then to full accreditation at international standard. The reputation of the organization is enhanced internationally, particularly amongst its peers. Accreditation provides visible evidence of the organization’s commitment to quality and to the delivery of safe and effective blood components. It provides confidence that the organization is providing services that meet the highest standards. It acknowledges a level of organizational competence that is on a par with other accredited organizations. It provides the assurance that the organization is continually working to improve the quality of its services. It provides the opportunity, at the time of the accreditation assessment, to receive objective feedback from well trained and skilled peers. This is also an opportunity to learn best practices that may be adopted by the organization. Staff morale is improved as training and competency programmes ensure that all employees know exactly what they are doing and also because they are made aware of the excellent standard of the services being delivered. Step 1 Certification: The facility demonstrates conformance with the AfSBT Standards required at Step 1. Step 2 Certification: The facility demonstrates conformance with the AfSBT Standards required at Step 2. Step 3 Accreditation: The facility demonstrates conformance with the AfSBT Standards required at Step 3. Facilities certified or accredited at any of the three steps will be added to the AfSBT Accreditation Register. Surveillance assessment Follow-up assessment after granting of accreditation/certification  Repeat assessment Repeat assessment in new cycle. 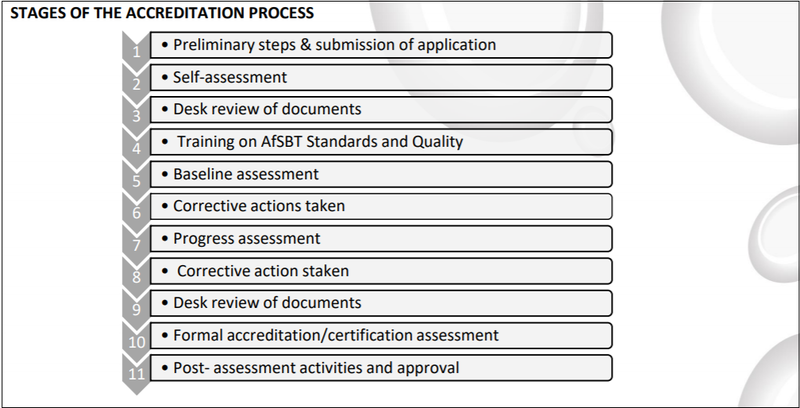 The stages shown in the diagram above provide an outline of the accreditation process. This is provided as a guide only, and points may be omitted or changed as dictated by circumstances. The timescale for carrying out listed tasks will be decided jointly between AfSBT and the applicant. The time taken for accreditation to be achieved will depend on several factors, including the state of preparedness of the facility when the application is made; the extent to which training and technical assistance are required; the availability of AfSBT assessors/educators and the availability of funding. The official language of the AfSBT Step-Wise Accreditation Programme is English, and although documents may be translated into French and Portuguese, and assessments conducted in these languages, in the event of a dispute the English version of any AfSBT document shall be considered definitive. The AfSBT Standards Committee, which sets the AfSBT Standards, ensures that they are kept up to date, and rules on requests for variances that may be made by a facility during the assessment process. The AfSBT Accreditation Committee, which oversees the procedure followed in each assessment, reviews the findings and recommends to the AfSBT Board whether or not certification or accreditation should be conferred on the facility. To correspond with AfSBT through personnel who have the appropriate authority to handle the correspondence and to deal with all correspondence and requests from AfSBT promptly. To complete agreed corrective actions arising from non-conformances within the specified time. AfSBT will develop and share with the facility a budget for all assessments steps. AfSBT will share with the facility the provisional role and responsibility of all parties involved in the process. The facility and AfSBT will agree to the budget and responsibilities by signing a formal contract. Assessors, Educators and others involved with the accreditation programme should perform their duties competently, honestly, diligently and responsibly, complying with any applicable legal requirements. Duties should be carried out in an unbiased and impartial way, and gifts or other inducements that could influence their judgement should never be accepted. Findings, conclusions and reports should fairly and accurately reflect the activities being assessed. Assessors and educators may become privy to sensitive information during an assessment, and should never disclose or discuss this information with a third party, or use this information for personal gain. Assessors and educators should be independent of the activity which they are assessing and should have no conflicts of interest with the facility being assessed. All findings and reports should be based only on the evidence disclosed during the assessment and not influenced by pre-conceived or personal opinions. Because of time and other constraints, assessments are usually based on samples of the information available, but it is important that appropriate use of sampling is made, and that the evidence is verifiable.